On my last trip to Scar Mountain, along the Old Cascades Crest trail, I became intrigued with the idea of linking up the Three Pyramids. I couldn’t find any trip reports online describing such a hike. Pulling out the maps, I learned a little more about the terrain. Only the Middle Pyramid had a trail to its summit, the former site of a lookout tower. North Pyramid was only a short ways off of one trail, and the toughest looking bit looked to be the South Pyramid, at least a one mile walk from any trail. I began my trek from the North Pyramid trailhead, the same starting point for the Scar Mountain hike. Almost immediately, I got lost among a jumble of short, overgrown gravel roads. I angled into the woods in the rough direction I thought I needed to go, and stumbled across a nice looking trail. The trail led downhill to a small bridge and a thickly overgrown, streamside meadow. Bushwhacking through face-high ferns and salmonberry bushes, I followed the sound of the creek to find a second bridge. Once on the other side, the trail was easier to follow. I continued uphill and crossed road 2047. The trail continued along in spurts of uphill sections and traverses. Eventually, the trail climbed up through a series of switchbacks to gain the ridge between North and Middle Pyramid. At the saddle between the two, the trail provided a sunny view of the mountains. Looking back, I could see the summit of North Pyramid. It looked totally do-able on the way back, if I could avoid the rocky cliffs. I finished the walk up to Middle Pyramid, ending up at what appeared to be another saddle between two bumps. I mistakenly took a left, scrambled to the top of a rock pile, and looked south to see a post on the other bump, presumably the true summit of Middle Pyramid. I quickly made it over to the post and settled in for an early lunch. This gave me a great vantage point to both North and South Pyramid. The south side of the summit dropped sharply to what looked like a cliffy and steep ridge to South Pyramid. The summit block of South Pyramid also looked blockaded by rock cliffs. It would have been too much for me on my own today, so I took a bunch of pictures and put that Pyramid on hold, for now. Looking at the map, a southern approach looked to be a better way to get up there. Oh, and the views from the old lookout site weren’t bad, either. Returning the way I came, I veered off the trail about halfway along the high traverse and followed the ridge north. The forest was gently sloped and open, with trees and beargrass lining the ground. On the east side, the forest gave way to steep, rocky meadows, and eventually I was pushed up to a blocky ridge that was overgrown with moss. Following the path of least resistance, I eventually reached the end of the ridge, and had spectacular views towards Mt. Jefferson. I looked around for a summit register, but couldn’t find anything. It was a nice little place to sit and hang out, with the exception of all the biting ants. Once they got used to my presence, it seemed, they left me alone. Anyways, the views up here were tremendous, with nothing obscuring the sightline to Jefferson. Plus, I got a nice vantage point to look at Scar Mountain, the last place I went hiking. Not wanting to retrace too many of my steps, I angled back along the ridge for just a short while before descending the steep, western face. I intended to pick up the trail at the switchbacks, but the lay of the land forced me a little too far north to do that. Instead, I ended up walking and sliding down a gully, grabbing on to trees and bushes for balance as I made my way back to a nice, gentle section of trail. I was heavily assaulted by mosquitoes along this particular section of the bushwhack, which was unusual. I had hardly seen a mosquito all day long. Back on the trail, time flew by. Once I reached the bridge over the creek, I stopped to collect salmonberries for the Fourth of July BBQ I’d hit on the way home. Unfortunately, the bushes were growing right at the creek’s edge, with the only access being from the creek itself. I slipped off my socks and shoes and walked through the ice-cold, ankle deep water. The berries were flourishing, ripe, and tasty. On the way back to the car, I completed the short section of trail that I missed on my hike out. Turning around, I saw a barely noticeable brown post marking the start of the trail as it left one of the brushy roads. Easy to miss. 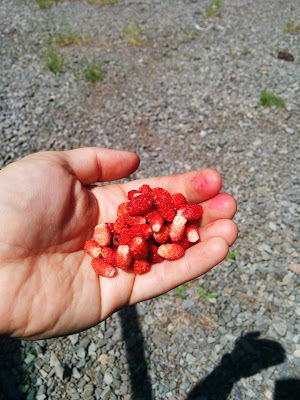 Back at the car, I noticed that the parking area was ringed with ripe, wild strawberries. I had a tiny bit of space left in my berry container to gather a small handful of strawberries before taking off. Although I just read an article in the Salem Statesman Journal about the Middle Pyramid hike (from another trailhead), I’m sure this area does not see a ton of traffic. Certainly few people take the longer route that I did, although it’s not that long and it’s quite nice. If I someday become interested in backpacking, I’d love to traverse the whole Old Cascade Crest trail. This entry was posted in Hiking, Oregon and tagged hike366 on July 12, 2014 by Jess B.